Starting is the hardest part of choosing paint colors for your home. So make it a bit easier by thinking about what colors you’re naturally attracted to. Looking at your favorite pictures, pieces of art, clothes that you own, or furniture and decor already that you have already can be a fantastic place to spur your creativity. 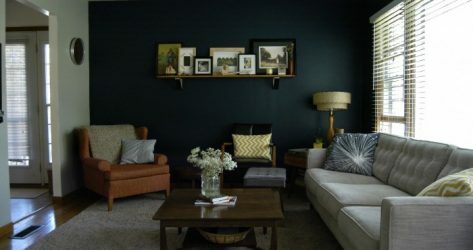 A bonus is that if you use your furniture or artwork for inspiration, you won’t have to worry about your new paint color clashing with them. Tools like ColorSnap from Sherwin-Williams are perfect here because they match any color you come across to the exact matching can of paint. Make sure that the lighting and paint color in your home are complementary. These two factors play off each other and can make a huge difference in the way your place looks at different times of the day. Firstly, the direction each room faces makes a huge difference in how much light it gets during the day. Secondly, the time of day makes rooms look different in the morning, afternoon, and evening. Finally, the type of lightbulb you use can throw different hues of color around your home. For these reasons, make sure to check out your paint samples at all different times of the day and when the lights are on too. Choose One: Cool or Warm? While you should use multiple paint colors around your home, make sure that they all flow and look good together. One easy way to do this is by sticking with either cool or warm tones. Choosing similar tones creates a sense of harmony, while picking different tones can give off a sense of disjointedness when you move from room to room. For example, gray with brown undertones makes a nice, warm color. While gray with purple undertakes a calm, cool color. But never should the two meet. You’ve done it, you found that big, bold color that will really make your room pop. Now you just need to make sure that now you’ve found your focal point, you actually center your room around it. Make sure not to distract with brightly colored furniture and keep everything else in the room neutral by using whites, creams, and grays. By doing this you can have bold colors in your home without being too overwhelming or distracting. With these tips, you are well on your way to choosing the paint colors of your dreams. And when you live at Monroe Street Market, making this decision couldn’t be any more convenient because Annie’s Ace Hardware is coming to Brookland for all your painting needs.